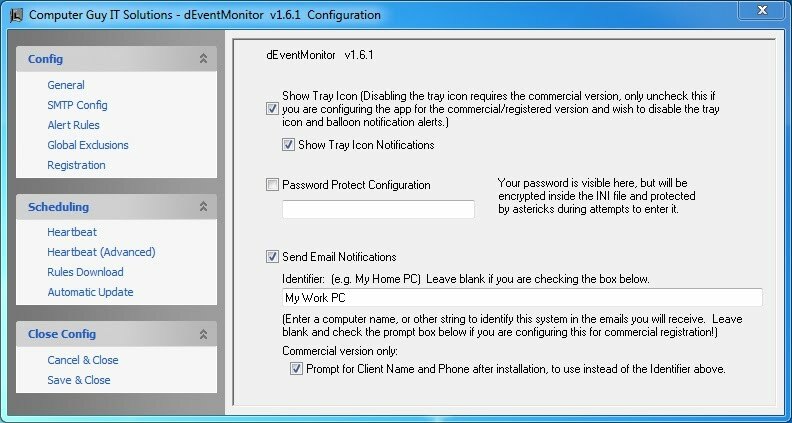 Show Tray Icon Notifications – This option enables notifications from the system tray in the form of balloon tip popups when an alert rule is triggered. Password Protect Configuration – This option enables a password requirement to access the configuration screens. Identifier – Used for identifying the PC, this adds the text you specify to the subject of the email you will receive when an alert is triggered. This option is not used in the registered version in favor of the next option. Prompt for Client Name … – When checkced, this option will prompt you for the client’s details (name, phone number, and a description of the PC) after installation of dEventMonitor. This more detailed information will be added to the email you receive when an alert is triggered, instead of the basic Identifier above. SMTP Config: Required to receive email alerts, you must set up an SMTP account here. If you do not have a server to use, I recommend setting up a free Gmail account in order to use it’s SMTP server. I personally have a Gmail account which I only use for this purpose. SMTP Username – This is typically your full email address. SMTP Password – for Gmail you want to be sure to check Authenticate below this. Your password will be stored with basic encryption inside the dEventMonitor.INI file to keep it away from prying eyes. Default From Email Address – This address is where the email is coming from and will be used in replies, and is usually configured to be the same as your SMTP Username. 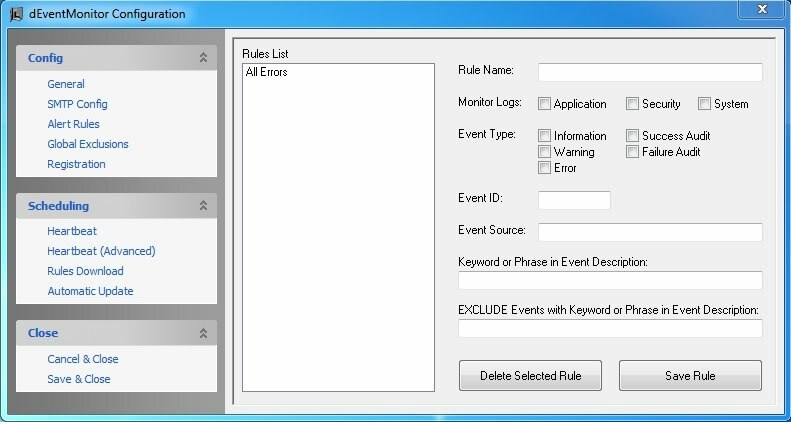 Check the Monitor Logs option for each event log you wish to monitor, or any combination of them. You must check at least one. Check the Event Type to monitor, again any combination of types are acceptable. You must check at least one. Input the Event ID if you wish to monitor for a specific Event ID, else leave blank. Input the Event Source if you wish to monitor a specific source, else leave blank. Enter a Keyword or Phrase to scan for in the Event Description text, else leave blank. Enter a Keyword or Phrase to scan for in the Event Description text, which will EXCLUDE alerts from being triggered, else leave blank. Click the Add Rule button, and your rule will appear in the Rules List. Each rule you create is stored as a separate .DAT file in the installation directory of dEventMonitor, inside the Rules subdirectory. This makes created rules easy to transfer to new PCs where you install dEventMonitor, or also to take advantage of the Rules Download feature you will read about next. Global Exclusions: Here is where you can define a list of Global Exclusions. Any item in either of these lists will be excluded from triggering an event alert, even if the item matches an item in your Alert rule set on the previous configuration page. 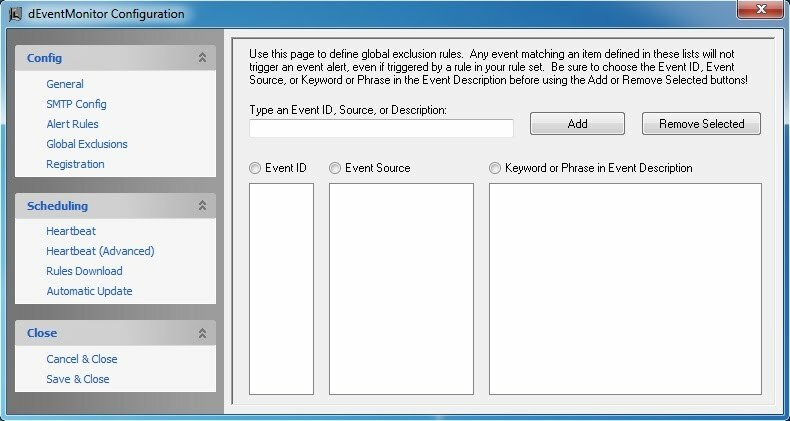 Define any Event ID, Event Source, or Keyword / Phrase in the Event Description to always exclude these from event alerts. Heartbeat: Here you may schedule a “heartbeat” email alert to be sent to you on a regular basis. Automatically create this scheduled task after install – for the registered version only, when checked your installer will automatically create this scheduled task. 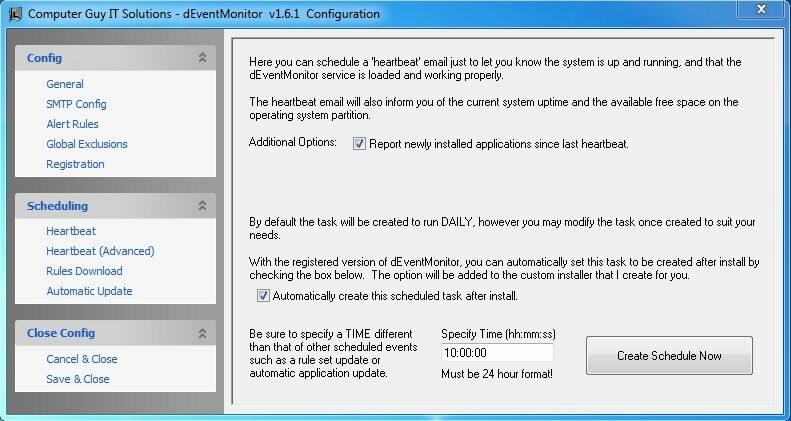 Services to check during heartbeat: This is a list of Windows services you can configure, to include the current status of the service included in the heartbeat email. Note you MUST use the actual service name, not the descriptive service name! e.g. “BITS” is correct, whereas “Background Intelligent Transfer Service” is incorrect. Free Space check list: Here you can select other partitions to check for free space during the heartbeat. SNMP devices to check during heartbeat: Here you can send a simple query to any SNMP enabled device on your network for a specific OID. This is useful just to check for signs of life! Rules Download: You can create up to four different profiles of rules which can be scheduled to automatically download, so your rules on a client’s system will stay up to date with what rules you want them to have. This is useful for when you decide to add, modify, or remove any number of your rules. The reason for creating four different profiles is because you may want to maintain different rule sets for different PCs, example one for workstations, one for file servers, one for servers with Exchange, etc. etc. * To create a schedule to download the rule sets you specify, you must be using the REGISTERED version of dEventMonitor. By default, when you create a scheduled task to download the rule set, it will run daily at 9am. After the scheduled task is created you will be prompted to open Windows Task Scheduler to modify/refine that schedule to suit your needs. OPTIONAL: You may also include an updated dEventMonitor.INI file in your rules ZIP file if you wish, to be installed along with your updated rule set. This can be useful if you have to modify some information in the INI file such as the General options, your SMTP config, even your profile download locations, etc.